Could the Tampa Bay Lightning be willing to trade Ben Bishop? The Tampa Bay Lightning entered the 2016-17 NHL season with an awkward goaltending situation. Not only did they have a clear starter (Ben Bishop), they also had his clear replacement (Andrei Vasilevskiy). While this is understandable since the former is a free agent after this season, it hasn’t worked out too well for the Lightning. 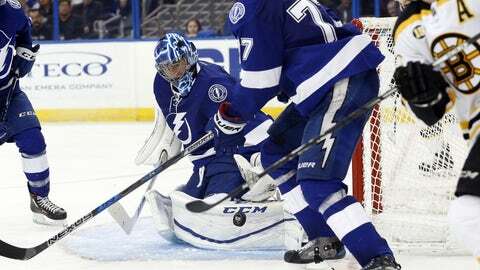 Bishop has only appeared in 27 of Tampa Bay’s 51 games so far this season. With the team fighting to make the playoffs, the Lightning aren’t ruling out a trade of their prospective free agent. What is Steve Yzerman’s acceptable threshold for a Ben Bishop trade? There is a growing sense Tampa Bay is willing to move the goalie, give him a fresh start six months before unrestricted free agency. The move benefits the Lightning, too, allowing Andrei Vasilevskiy the rest of the season to learn what it will be like to be the full-time No. 1 in goal. A Bishop trade would help both sides. It definitely makes sense for the Lightning. As much as Vasilevskiy has struggled this season, young goalies have to play themselves out of slumps. If Yzerman is willing to throw in the towel for the season, even with the unpredictability of the goalie market, someone would pay top dollar to rent Bishop. Who would show interest in him? The St. Louis Blues, judging by their goaltending woes, would love to have him. Perhaps the Dallas Stars will show interest, as despite their struggles, they’re still in the playoff race. Don’t rule out the Nashville Predators, especially if their faith in Pekka Rinne is dwindling. Depending on where the Carolina Hurricanes are in the postseason hunt in late February, they’d be a strong candidate as well.